Now that the date for the Brexit referendum is set, it’s about time for us to start figuring out how the pound’s forex trends might fare leading up to the vote. It’s no secret that uncertainty generally dampens currency demand, as investors tend to avoid exposing their portfolios to high-risk situations while traders try to price in the potential gloom and doom in a worst case scenario. This was particularly evident during the weeks ahead of the Scottish referendum back in 2014. At that time, the relationship between the Brits and the Scots was on the rocks because of the ongoing austerity program. Speculations of a break-up weighed heavily on the British pound, as calling it quits with Scotland would leave a much higher debt burden on the rest of the U.K. and dampen foreign investment. Cable tumbled nearly a thousand pips from the 1.7100 levels to the 1.6100 area a couple of months ahead of the referendum while Guppy had a more volatile run, popping back and forth between 173.00 and making lows near 170.00. 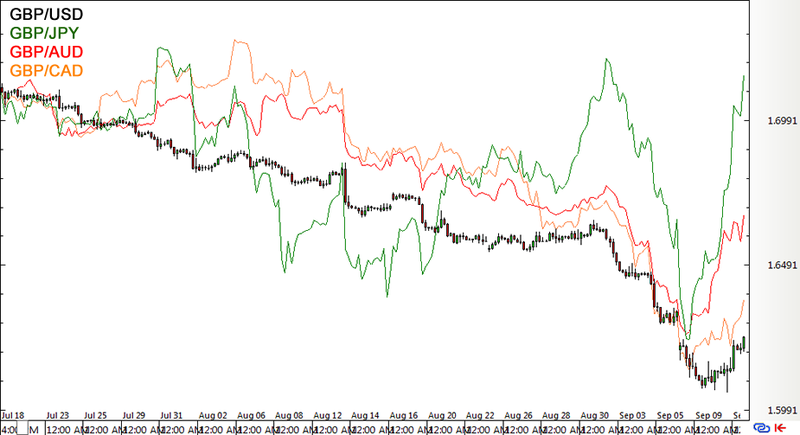 GBP/AUD and GBP/CAD also staged a pretty steady forex downtrend prior to the Scottish vote, with the former falling by around a thousand pips from 1.8200 to 1.7200 and the latter dropping from a high of 1.8507 in August 2014 to a low of 1.7537 in the first week of September. By then, pound forex traders probably took profits off their short positions, triggering a rally just a few days before Scots headed to the polls. 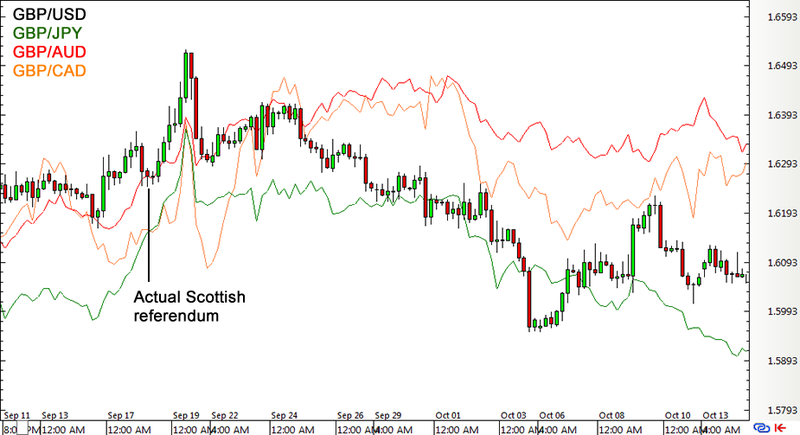 The British pound managed to avoid a forex heartbreak when the exit polls and referendum results indicated that the anti-independence camp scored a narrow victory. However, the bullish reaction was short-lived for GBP/USD and GBP/JPY while pound crosses managed to hold on to their post-referendum gains. Based on these forex charts, it looks like the pound might be in for more forex losses as Brexit fears linger, even as U.K. Prime Minister David Cameron and fellow Conservative Party chaps have been pushing for an EU deal that could address concerns regarding immigration and social benefits, economic governance, and sovereignty. So far, this proposal has failed to draw support from some members of Cameron’s business advisory group and London mayor Boris Johnson, creating even more political drama in the region and pushing the pound lower against its forex peers yesterday. Moving forward, more reports favoring a Brexit could wind up spurring pound losses while updates showing that the EU deal is gaining traction could give the currency a boost. Stay tuned!